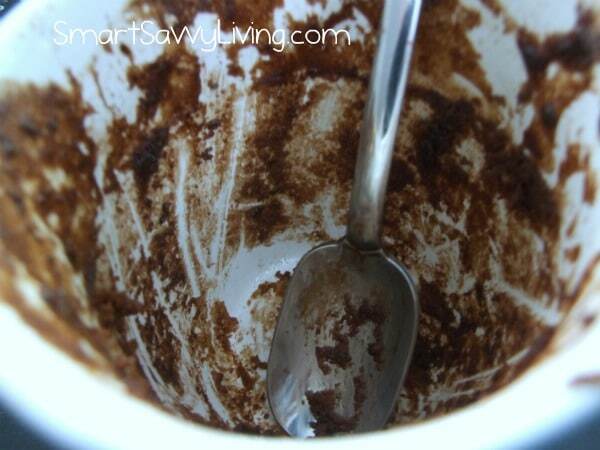 This Chocolate Mug Cake can be ready in minutes and is perfect for just one or 2 servings. Ladies, I’m sure you are all too familiar with those days we just can’t shake that chocolate craving. You know, those days where you feel like you’re going to have to hurt someone if you don’t have a bite of chocolate? I don’t know about you, but sometimes I want something different from a chocolate bar and one of my favorite desserts is cake. However, with just the 2 of us, and considering Mr. Savvy is rarely in the mood for a chocolate sweet treat, baking up a big cake just isn’t worth it. 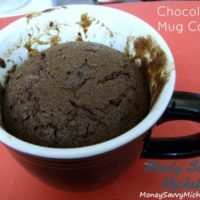 That’s why I started making these Chocolate Mug Cakes when the craving hits. These are super easy to make, taking just a couple minutes to mix together without having to dirty up several bowls. The chocolate cake can then be cooked in the microwave – or oven if you’re weird like me and don’t have a microwave. The most important thing about this recipe is to have a large oven or microwave-safe mug as you don’t want this overflowing in your microwave or oven as it rises. I use stoneware. The next is to use a very good quality cocoa as this is where the majority of your flavor is going to come from. I’ve always been a fan of Ghiradelli cocoa powder. Note that the resulting cake is on the large side (think large bakery muffin), so you may want to share if you’re not feeling overly indulgent. You can also cook the cake for slightly less time if you want more of a molten center, like I did. Just remember that if you’re pregnant or have a weakened immune system, you probably shouldn’t eat under-cooked eggs. The cake is great by itself, or served with whipped cream, ice cream or a drizzle of chocolate syrup or caramel sauce. I like to under-bake mine just a bit so it’s molten inside. 1/4 teaspoon vanilla, or other flavoring such as cinnamon, coffee, peppermint, almond, etc. If using oven, pre-heat to 350°F. I use a toaster oven. Spray mug with cooking spray if you want to remove it from the mug after baking. 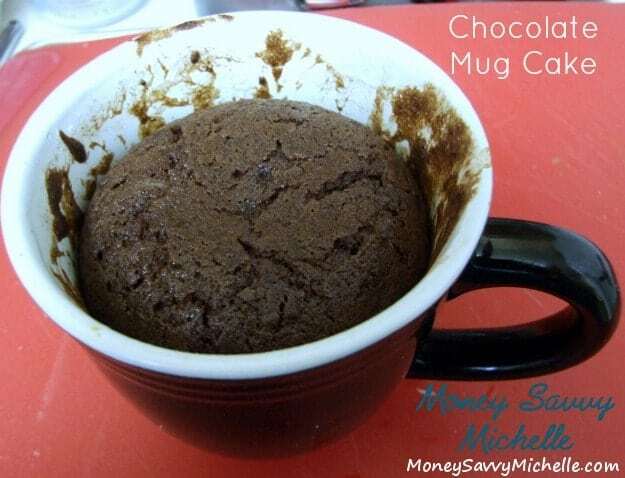 Mix dry ingredients (flour, sugar, cocoa, salt, baking soda) together with fork or whisk in large oven or microwave-safe mug. Add milk, oil, vanilla and egg, if using, and mix thoroughly, especially at the bottom of mug. 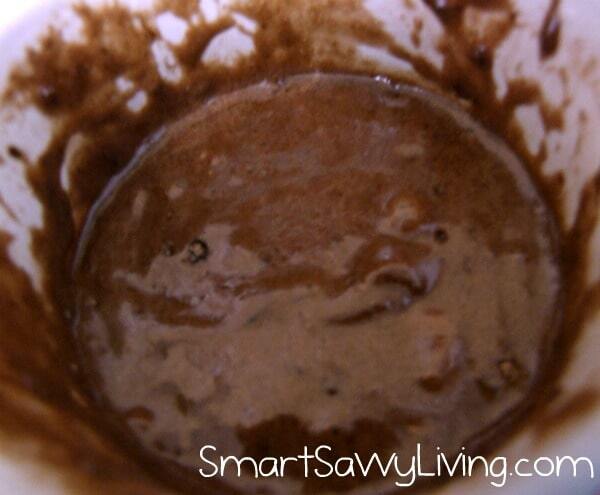 Stir in chocolate chips or other candy, if using. Bake in oven at 350°F for 15-25 minutes, according to how hot your oven cooks and if you want a molten or thoroughly cooked cake. You can also microwave on high for 1-3 minutes depending on wattage of your microwave. I suggest starting at 1 minute and then microwaving for 30 additional seconds until reaching your desired doneness. If you want a fudgier cake, leave out the egg entirely. Without an egg, the cake will not rise quite as much. 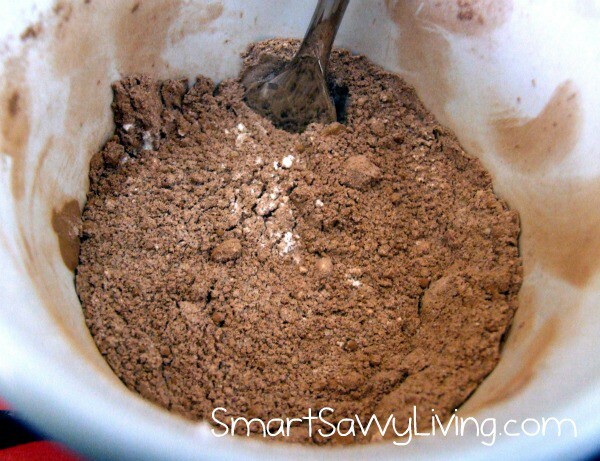 You may also want to add instant coffee or espresso, about 1/8-1/4 teaspoon, or substitute the milk for cooled brewed coffee to further escalate the chocolate flavor. That SO hit the spot! 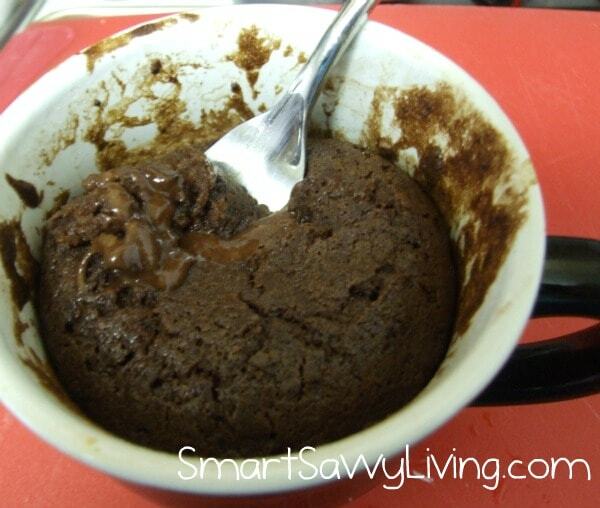 Check out some of our other dessert recipes if you enjoyed this Chocolate Mug Cake! what an easy recipe to use up my last bit of flour! thank you. Thanks for stopping by and trying my recipe. I hadn’t even thought about it being a good way to use those last tablespoons of flour – great idea! Hi! I’be been wanting to try out this recipie, but unfortunately, I don’t own a microwave. Only a small oven toaster that can go to about 240 degrees. Would that be an okay temp to bake a mug cake? Hi Eliana, thanks for stopping by. I’m not sure if you’re using Fahrenheit or Celcius but either way, I haven’t tried cooking at other temperatures so I can’t say for sure. If F, this is a lot lower than 350 and it would likely take significantly longer. If C I think it would be around 175C. I’m a 16 year old baker in training and so far I’ve tried baking thrice and they’ve always turned out terrible. But this recipe was amazing, used choco chips and got a molten cake, kinda like choco lava, absolutely delicious! Thanks a ton! Awesome, Blessie! I’m so glad it turned out for you. Thanks for letting me know. What can I use to replace the milk?